All our products use the common Windows Installer so it’s easy to both install and uninstall our products. To uninstall we’ve included step by step instructions below. If you have any questions regarding removing a product please contact us. 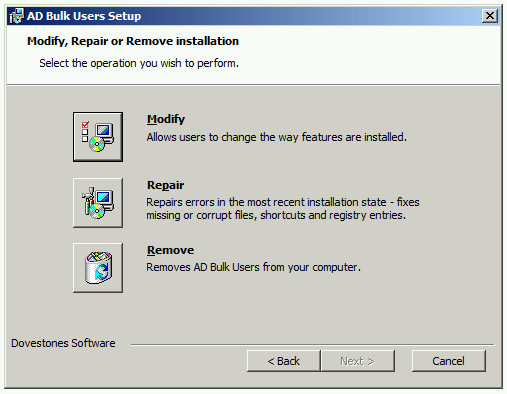 This page covers how to uninstall (remove) the following programs. Note: The screenshots below may not match your product but the uninstall procedure is the same. 1. You can uninstall/remove any of the programs listed above from your computer by using the Add/Remove Program feature in the Windows Control Panel. On the Start menu (for Windows Server 2012, right-click the screen’s button-left corner), click Control Panel. 2. When you find the program e.g. AD Bulk Users, click it, and then Click Uninstall. Follow the prompts. A progress bar shows you how long it will take to remove the program. 3. Alternatively if you still have the installer you can run the installer again and choose Remove then click Next and follow the prompts to remove the program from your computer. All programs require Microsoft .Net framework, if a newer version of .Net is added during installation this is not removed you may choose to remove this via the Control Panel.